The Color Deconvolution plugin for ImageJ can be used to digitally separate up to three stains from brightfield images, after which standard ImageJ commands can be used. The algorithm is described in Ruifork and Johnston (2001). 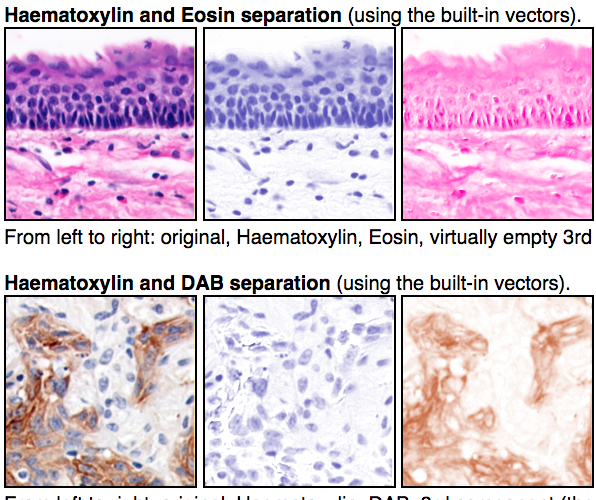 Stain colors depend on numerous factors, such as the precise stains and scanner; therefore, the 'default' stain vectors (used to define the colors) are unlikely to be optimal and may be very inaccurate. See the URL instructions for how to create new stain vectors. Pixel values should be interpreted with extreme caution; in particular, note the warning regarding 'brown' staining that attempting to quantify DAB intensity using this plugin is not a good idea. Note, the pixel values provided by this plugin are 8-bit and not equivalent to 'optical densities' frequently presented in the literature.